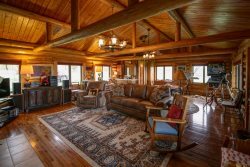 This family friendly Deer Run condo in Big Sky's Meadow Village is ready to be your mountain getaway! This spacious 3 bedroom and 3 bathroom end unit sleeps 6 comfortably, and has beautiful views overlooking the meadow and canyon. Comfort awaits you, including a master suite with king bed, main level bedroom with queen, and lower level bedroom queen bed. Relax after a day on the mountain in front of the condo's wood fireplace. Cook a delicious meal in the well-equipped kitchen! Don't feel like staying in? Just a 10-minute walk to Big Sky Town Center, which offers numerous shops, restaurants, free concerts in the park, movie theaters, farmers market and much more. Continue on a short drive or free shuttle to Big Sky Resort for skiing, snowboarding, shopping, restaurants, hiking trails, mountain bike trails, lake, spa, and zip lining. Big Sky Resort is "America's Biggest Skiing," offering winter enthusiasts 5,800 acres, 4,350 foot vertical drop, and average annual snowfall of 400 inches. Lone Peak, at 11,166 feet, offers challenging runs, iconic chutes, and magic carpets at the base offer kid-friendly beginner runs. - Full kitchen with electric range, coffee maker, toaster, Crock Pot, blender, bakeware, 6 place settings, basic spices, starter Starbucks coffee, trash bags, dish soap, dishwasher soap, sponge, and paper towels. The unit we stayed in was as clean as my home. good location, nicely decorated, and CLEAN! Had a great stay at the condo! Condo was very clean and had everything we needed. Hosts left a nice welcome basket with a few beers, popcorn, etc which was very nice. Location was great with just a 1 min drive to Town Center for great restaurants, grocery, etc. Would stay again! Easy to work with - great experience. We had a wonderful time - would recommend it to anyone visiting Big Sky. The place was clean, comfortable, and spacious. It was a great location for Skiing/Snowboarding during the day and enjoying the charm of the town of Big Sky Town Center in the evenings. You have to try the sleigh ride dinners if you go in the winter - such a great experience! Thanks Jon and Sara for allowing us to rent your place! We loved the decor and the location was perfect! You have everything you need staying here. You also have the convenience of the shops and eating areas right by the property. It is nice because it is quite and the atmosphere in Big Sky is very laid back and everyone is very friendly. We enjoyed our stay. Warm, inviting place with everything you need. Layout works great for lots of people. Would highly recommend it!! As stated above an excellent property centrally located to all available activities in Big Sky & the surrounding area. I recently spent a thrilling week at your condo in Big Sky. Our adventure commenced in Bozeman which is one of most charming and robust cities I have ever visited. Montana State University campus is most impressive as is the Rocky Mt. museum located on campus.We shopped for staples at Rousers, a grocery store that rivals anything in Mpls, St Paul. The trip from Bozeman to Big Sky which follows the Gallatin River Valley is spectacular and is a great precursor of the scenery to follow. The town of Big Sky is very western in appearance and does not attempt to be a faux "Alpine" village like Vail and other ski resorts. This is Montana, not Switzerland! Likewise the condo does not pretend to be something it is not. It is very nice,comfortable, accessible, warm and cozy place to stay. It easily accommodated 3 couples on 3 floors, giving all of us privacy. Although we love to take advantage of the many local restaurants, we did utilize the kitchen facilities and found them more than adequate for our needs. We tried many of the local eating places and especially enjoyed Lone Mountain Ranch, Olive B's and Riverhouse Barbeque. and the new tea place downtown. I am an early riser and each morning, I took a 10 minute walk to the Moose Deli that offers coffee, beer, wine and the newspaper. Retiring to the deck that overlooks the village is a great place to relax and read the paper. The activities are too numerous to tell you all of them, but we really enjoyed fly fishing; especially the float trip down the Yellowstone River with Brian and his guides. We hiked, white water rafted and even played golf and were instructed on the use of bear spray (we did not see any bear). I believe we could have spent a week in Yellowstone Park which is less than an hour away. In all of our experience in Big Sky and your condo in particular, it was a wonderful experience and we plan to return for a winter ski trip.